How reliable is the wireless technology? Has it been proven? What is the maximum distance between the electric eye and the announcer's booth (the "radio range")? What is the maximum distance between the electric eyes (the "optical range")? Does sun affect the electric eyes? How many times does the timer save in its memory? Can multiple electric eyes be set up to measure split times around and between barrels for training? What exactly is the "PA Horn"? What if I don't know what kind of PA system is used where I must use my timer? What do I need to connect my timer to a computer? Are the timers and electric eyes weatherproof? What are the timers' accuracy specifications? What size scoreboard do I need? Can I display a score or the time to beat on a scoreboard? What is the warranty on your timing equipment? The radio link will work reliably to about 300 feet. This assumes a clear line-of-sight from the antenna on the electric eye in the arena to the antenna on the timer console in the announcer's booth. For maximum distance, make sure the timer console in the announcer's booth is not hidden behind a ledge that blocks the antenna's view of the electric eye in the arena. It is also recommended that other electronic appliances (computers, monitors, PA system, etc.) be at least three feet from the timer console. The timer console runs about 50 to 60 hours on a fresh set of four AA alkaline batteries. Typically, this is enough for a couple months of use before the batteries need to be replaced. The timer gives a 1 to 2 hour warning that the battery is getting low. You can also check the percent of battery remaining at any time from the keypad on the console. No. The timer and electric eyes should not be left out in the weather. It is best to store them in a temperature and humidity controlled environment such as your house when not in use. If it is raining during an event and you wish to continue running, you can slip a thin plastic sandwich bag over each electric eye. You may want to snap a rubber band around the eye to keep the sandwich bag taught and smooth over the face of the electric eye where the beam exits and enters the eyes. The announcer's booth is generally dry for the timekeeper, but if not, slip the console into a plastic bag and continue operation. Repeatability of Beam Break Position (effective beam width): Better than 0.1 inches (measured in sunlight conditions with target moving at 10 feet/second). In order to maximize radio performance in a congested radio environment, the photo-sensor repeats the beam break transmission a total of 70 times and splits that transmission across two different frequencies. 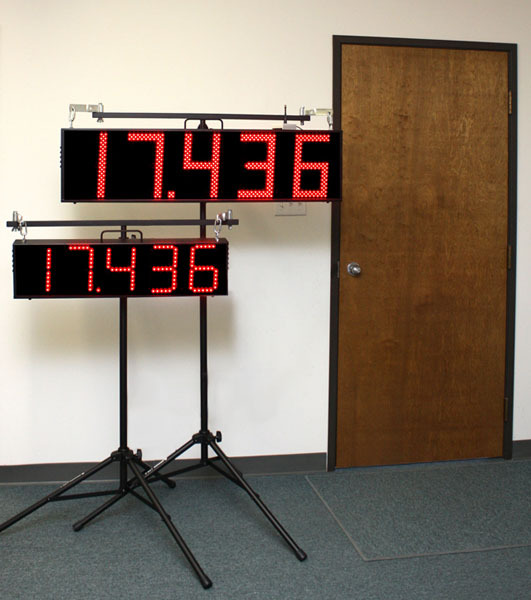 To maintain timing accuracy, each repeat of the message includes timing information that specifies the instant of the original beam break accurate to +/-0.062ms. Each message also includes a 16 bit station identifier (unique for every photo-receiver ever shipped), a sequence number and a CRC to ensure data integrity.